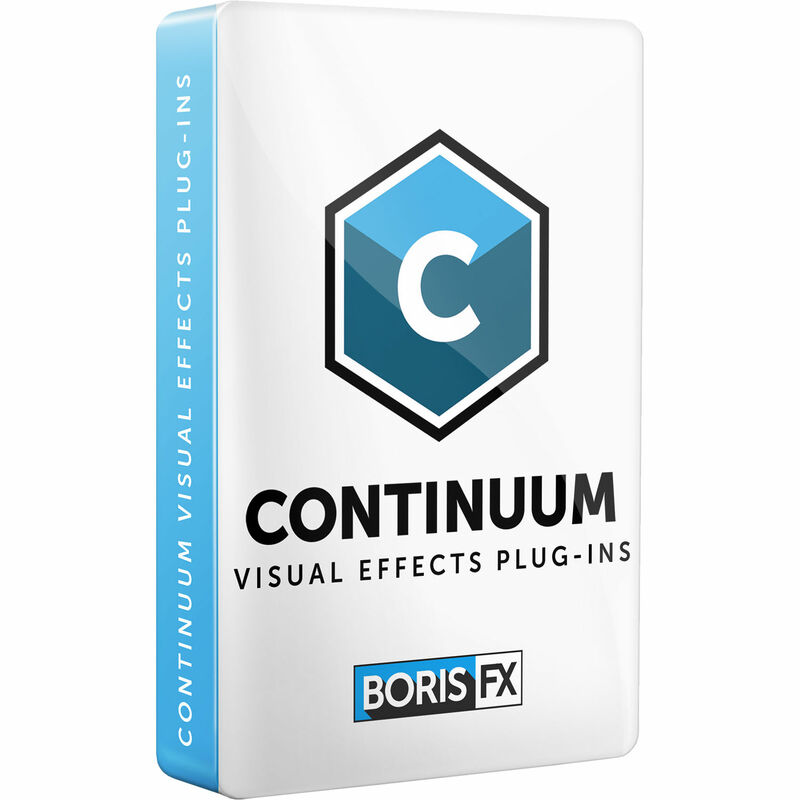 Boris FX Continuum 2019 for Avid/Adobe/OFX/Apple is a comprehensive visual effects and compositing plug-in collection. It consists of all individual Continuum 2019 Units, hundreds of features, and thousands of presets, which are customizable. If you customize a preset, you can save the personalized version as a new preset that can be recalled later. Many of the filters also feature a built-in PixelChooser with integrated Mocha planar tracking that allows for greater control over which areas of the image the filter should affect. This crossgrade is valid for existing owners of Boris RED. It provides you with a permanent version of Continuum 2019 for Avid/Adobe/Apple/OFX. 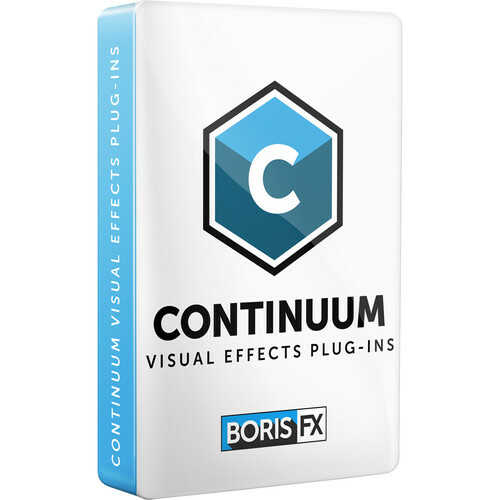 Continuum 2019 for Avid/Adobe/OFX/Apple is a multi-host plug-in compatible with Avid Media Composer, After Effects, Premiere Pro, Final Cut Pro X, Motion, DaVinci Resolve, Nuke, and Vegas Pro. It can be used in all host applications at the same time as long as they are on the same computer. Between all the different filters you can create 3D titles, logos, and shapes; apply various art styles; create various blurs and manipulate focus; make grading and toning adjustments; add film looks; restore images; apply compositing and cleanup; simulate most types of light; manipulate motion data; design realistic particle effects; display images in different perspectives, such as shattered and dispersed into space; add stylized visual effects, like damaged TV looks; add textures; manipulate time with loop and other effects; add transitions; apply common VFX solutions for VR/360 video; and distort and morph video in various ways. The new features in Continuum 2019 include a new and redesigned Particle Illusion unit, which features real-time GPU-based particle generation, a standalone option, and a revamped emitter library. The built-in Mocha tracking tool now includes an updated Mocha essentials workspace, four new spline tools, parameter-driven tracking, and support for high-DPI and retina displays. Title Studio has also been updated with new image processing shaders, 3D materials, 8K or higher support, grids and guidelines, on-screen text tool and text box, 150 new additions to the preset library, and faster playback. See more about these and all the features in the Filters list below. For managing and browsing all the effects presets, Continuum 2019 features an updated FX Browser, which can be accessed within each filter, as well as independently wherein you can browse the entire presets library. When you want to check out what a particular effect will look like on your footage, simply select a preset in the FX Browser, and Continuum 2019 will provide a preview of the effect on your actual clip as opposed to a sample poster frame. Continuum 2019 for Avid/Adobe/OFX/Apple can be used in your host application on Mac or Windows, as supported by the host. Note: Some of the filters may not work within every host application. The introduction of Mocha-based parameter tracking renders most non-real time blue dot filters unnecessary. Non-real time filters have been moved into an obsolete folder to support the older legacy Continuum tracker. Editors and artists will love the simplified, clean interface that focuses on only the most essential icons and tools. Master tracking quicker. Four new spline tools make masking and roto work even simpler. Includes a new magnetic spline tool with edge-snapping, a freehand tool, and geometric shapes like ellipse and rectangle. Position point parameters in Continuum filters can now be driven directly by Mocha. Track filters like Lens Flare 3D, Rays, and Spotlights. Support for high-DPI and retina displays. Image processing shaders create new compelling materials previously not possible. New professionally designed material presets can be found in the Materials Palette. Text objects can now be repositioned and scaled with the click of a mouse. Scale faster and more accurately. 150 new professionally designed presets using the new Image Processing Shaders have been added to get users up-and-running quickly. Simply drag & drop or customize and save your presets in the new library. Playback within the Title Studio UI now supports 8K or higher resolutions. Title Studio is a 3D titling and animation plug-in that allows quick and easy creation of 2D/3D titling and motion graphics (including C4D model import) directly inside the host of your choice. Title Studio supports a custom UI to enable a vastly richer motion graphics toolset than can be achieved with just native host parameters. Yet, in addition to that flexibility and power, it offers very simple browsing, applying, and customizing pre-made animation presets/templates using the FX Browser (not supported in Apple hosts). Title Studio adds 100 presets and 3D render options, including depth-of-field. Extruded EPS enables you to import, extrude, and animate 2D vector artwork using either the native Adobe Illustrator .ai or .eps format. You have the option to retain the original colors of the imported eps/ai file or create your own using the built-in material shader controls. Extruded Spline generates true 3D primitive shape objects with separate control options for each of the 4 sides of the extruded object. Extruded Text generates true 3D text objects with separate control options for each of the 4 sides of the extruded object. Layer Deformer allows you to transform, warp, and deform any image clip or layer into 3D primitive shapes, which can be animated in 3D space with full automation and manual override over the 3D animation. Type-On Text enables you to generate true 3D type-on text animations, with full automation for the type-on / type-off effect and manual override controls for the animation timing. Cartooner allows you to draw an outline around the edges in one of an image's color or alpha channels. You can also use the Cartooner filter to turn a video source into an outline animation. Median makes each pixel look like the majority of its neighboring pixels. It produces a smeary, painterly look, but with sharp edges (at neighborhood boundaries). Median also reduces noise by eliminating "spikes" or pixels that are very different from their neighbors (also referred to as "salt and pepper noise"). Artist's Poster creates a posterized effect by reducing the image to eight "pure" colors (Red, Green, Blue, Cyan, Magenta, Yellow, Black, and White) and processing each color separately. At its default settings, the filter outputs the NTSC-safe color that is closest to each of these eight colors. Bump Map is used to create 3D detail on an image based on the luminance information in the image. The luminance value of each pixel of the image creates height, with brighter pixels creating more height. Cartoon Look is designed to emulate the look of rotoscoped animation, popularized by the film remake of "A Scanner Darkly" and also seen in broadcast TV advertisements for the Charles Schwab company. Halftone simulates the look of printed material by converting the image to simulated halftone dots. Print images are comprised of a rosette pattern of colored ink dots. To avoid moire or interference patterns, the dots are printed at different angles. This process is known as halftone screening. Charcoal Sketch takes input from an image clip and converts this into a charcoal sketch style animation. In addition to advanced controls to fine-tune the result of contouring and line generation, the filter allows for detailed control over line softness, line style, and line threshold. Pencil Sketch takes input from an image clip and converts this into a hand-drawn pencil-sketch-style animation. In addition to advanced controls to fine tune the result of contouring and line generation, the filter allows for detailed control over line softness, line style, and line threshold. Spray Paint Noise generates a flat spray paint color on the image. Tile Mosaic is designed to emulate the look of an image that has been formed of cut ceramic or glass tiles. This filter is based on hardware-assisted rendering technology and will deliver a high level of performance when paired with a supported graphics card. The tile patterns that this filter is capable of generating can be arranged in either a symmetric grid pattern, as one might find in a modern home, or they can be cut into random ragged shapes, with the amount of jaggedness controlled by the algorithm at the heart of this filter. Water Color takes input from an image clip and converts this into a water-color stylized animation. In addition to advanced controls to fine-tune the result of contouring and line generation, the filter allows for detailed control over line softness, line style, and line threshold. Directional Blur blurs the image by displacing it in one direction. The effect is similar to how a photograph of a speeding object appears if taken with a slower shutter speed. In addition to advanced controls to fine-tune the quality of the blur, the filter allows for detailed control over Blur Amount, Angle, Thin, Spread, and Blur Threshold. Fast Lens Blur is a 100% GPU-accelerated (OpenCL) filter that emulates a lens blur defocus/rack-focus effect where out-of-focus highlights of an image clip take on the shape of the lens diaphragm. When a lens is used with its aperture fully open, the out-of-focus highlights are typically in the shape of a circle, however, when the lens is stopped down the highlights turn into multi-sided shapes. This filter includes a pop-up that can be used to match the different looks that can be achieved in the physical world based on the lens aperture setting. Fast Lens Blur also includes a comprehensive depth-of-field (Z-Depth) option whereby a separate image can be used to control the depth and position of the focus field. Gaussian Blur implements a popular blur algorithm that produces very smooth blurs. Gaussian Blur softens the image by averaging each pixel with its neighboring pixels. The word "Gaussian" refers to the bell- shaped curve commonly used in statistical analysis. The shape of this curve determines how much each averaged pixel contributes to the output. Lens Shape emulates a lens blur defocus/rack-focus effect where out-of-focus highlights of an image clip take on the shape of the lens diaphragm, however, Lens Shape takes an image input and uses this for the highlight shape. When a lens is used with its aperture fully open, the out-of-focus highlights are typically in the shape of a circle, however, when the lens is stopped down the highlights turn into multi-sided shapes. This filter includes a pop-up that can be used to match the different looks that can be achieved in the physical world based on the lens aperture setting. Fast Lens Blur also includes a comprehensive depth-of-field (Z-Depth) option whereby a separate image can be used to control the depth and position of the focus field. Motion Blur creates a realistic blur on the motion in an image, simulating the effect of shooting a moving object on film. The blur is based on the motion of the pixels in the image. For example, you can apply Motion Blur to a clip of a speeding car and the car's motion would blur while the background would not. The blur is most pronounced when the object moves quickly and more subtly when it moves slowly. Motion blur is not visible if the image is static. Based upon optical flow technology, this filter examines past and future frames to determine the motion of the pixels in the image. Depending upon the selected settings, a blur or a smear is applied to the pixels that move from one frame to the next. You can use an image in the timeline as a source for motion and then apply the motion from the chosen image to the filtered track. Pyramid Blur emulates the look of shooting in soft focus or with lens diffusion. It allows you to blur the horizontal and vertical components of the image separately. Pyramid Blur uses a refined algorithm that speeds rendering approximately 20 - 40 percent. Radial Blur creates a blur around a specific point, simulating the effect of a zooming or rotating camera. The Amount option specifies the amount of blur, depending on the selection for Type. For a Spin blur, which applies blurs in circles around the center point, the Amount value indicates the degree of rotation. For a Zoom blur, which applies blur that radiates out from the center point, the Amount value specifies the degree of radial blurring. Spiral Blur creates a blur or smear that appears as though it is spiraling toward the center of the image. In addition to the ability to adjust the amount of blur, users are able to fine-tune other aspects of the filter: Blur Type, Center, and Spin Angle. Unsharp Mask uses a classic image sharpening technique similar to the method used to sharpen film images. The source image is blurred, and the blurred image is then subtracted from the source. The resulting image is sharper and has more contrast. Unsharp Mask sharpens areas in an image with significant color changes by adjusting the contrast of edge details to create the illusion of image sharpness. This filter is useful for refocusing an image that appears blurry due to scanning, poor lighting, or other factors. Z-Blur uses a Z-map image to emulate a rack focus effect. Move the focal plane through the source image, using the Z-map to control the focus. Adjust the focal point, depth-of-field, and blur parameters to fine-tune the area of the image to blur. You can also set a channel from the image clip, then use that channel to control the Z-blur effect. This type of effect is most noticeable in real life with a long focal lens, such as a 105mm or greater zoom lens. Correct Selected Color allows you to adjust a specified range of colors in the source image, leaving colors outside the range unaffected. To correct two or more separate colors within an image, apply the Correct Selected filter as many times as needed. Tritone creates a toned image from the source image's luma channel or any of its RGB channels. The Input Channel maps to a color range that goes from the Black Color to the Middle Color to the White Color. The default Tritone uses the source's luma channel as the Input Channel to produce an image that is black where the source is black, white where the source is white, and blue-toned in the gray regions. Adjusts the brightness and contrast in your image. Color Correction improves the color of images or creates dramatic color effects. In addition to the ability to adjust luminance levels and saturation, the filter allows users to fine tune Brightness, Contrast, and Hue. Color Match simplifies the process of matching the color or luma values of two clips in the timeline. For instance, if two clips with different lighting conditions are spliced together, the color and luma values will differ between the clips. Match Color automates the process of removing or balancing the difference between the two clips by setting color or luma values for the quarter, mid, and three-quarter areas of the image. Ideally, you want to view both the Source and Target clips so that you can sample colors. Colorize uses a gradient of up to six colors to tone the image. All of the parameters in this filter can be animated and linked to other parameters. 3-Way Color Grade enables you to color-correct an input image using industry standard Lift-Gamma-Gain controls with an intuitive color sphere and slider interface. The filter includes a built-in keying option for isolating secondary colors from the primaries and power window style masking (with 2-point motion tracking), which allow you to isolate or selectively apply the color correction to specific region of the image. Independent color correction adjustments can be applied to points inside and outside of the key-mask selection within a single instance of the filter. Compare controls, located at the top of the filter, let you compare the input and processed image, or two independent color correction settings applied to the image. All internal processing in this filter is done in 32-bit floating point for maximum precision, thereby eliminating any round-off errors. This allows you to combine extreme settings of the different controls without introducing banding on the image output. Invert Solarize inverts one or more channels in the source image. With the Channels menu, you can specify which channels to invert. You can choose from a number of available options, such as RGB, RGBA (RGB and Alpha), Alpha, Luminance, Hue, Saturation, Lightness, and any combination of red, green, and blue. Levels Gamma provides options for adjusting contrast and eliminating noise in your image. Video shot at night or in poorly-lit settings often contains noise in the dark areas. Increasing Input Black removes this noise by treating all areas darker than the Input Black setting as black. Washed out or overexposed images do not contain the full range of levels. Increasing Input Black and/or decreasing Input White can boost the contrast of the image. MultiTone Mix uses the source image's color, luma, or alpha information to create a toned image that uses up to five independent colors. MultiTone Mix works by creating a color map based on a specific channel in the source image, then replacing each color range in the map with a new color. Safe Colors prevents clips from having saturation values that exceed the legal limits of broadcast standards. Use this filter to limit the values that are present in the image. In addition to being able to adjust the saturation limits, the filter allows you to fine-tune the pixels in the image that are affected. Videoscope was designed to provide a helpful way to measure the chroma and luma values in a clip. Because it is applied as a filter, it can be moved or positioned anywhere in the filter effects stack in the effects controls window and thereby display important information. Deinterlace converts interlaced video clips into progressive-scan clips. Deinterlace can render "simulated TeleCine" style by adding pulldown. It can also convert 29.97 fps NTSC video into 24 fps film-style frames. Fast Film Glow generates a traditional film glow look where the frame is subjected to a strong light source causing the image to bloom. It does this "fast" thanks to 100% GPU-acceleration. Fast Film Process allows you to give video footage the appearance of having been shot on film, and it does this "fast" thanks to 100% GPU-acceleration. This filter integrates different types of media in a single project. For example, match computer-generated animations with archival film stock, make video appear like color-pushed film, infrared film, or color reversal film, or make images appear warmer or cooler. You may want to combine this filter with the Deinterlace, Film Grain, Film Damage, or Match Grain filters for the most realistic results. Film Damage simulates the appearance of old film stock, allowing you to create a wide variate of age related damage. Among some of the features of the filter, you can add scratches, grain particles, hair or fibers, dirt, dust, and water spots. Film Damage also allows you to simulate camera shake and a flickering image. Film Grain generates an auto-animated noise effect designed to simulate the appearance of grain particles in the emulsion of movie or photo film. Built-in filter parameters provide the ability to fine-tune film tinting, grain size, and monochromatic or RGB grain amount. Match Grain copies the grain signature from a source clip and applies it to a destination clip. This allows for more realistic compositing. Grain that has been sampled from a source clip can also be stored and reused with the separate Grain Preset options. Two Strip Color simulates the look of vintage two-strip or three-strip film color processes. It allows for greater control over the mixing of color through additive and subtractive processes to simulate a look such as Technicolor. Vignette provides a convenient way to darken and / or blur the outer region of the input clip. Built-in controls allow for the vignette shape to be anything between an oval and a square, with hard or completely smooth feathered edges and the built-in apply modes offer the ability to generate truly unique and interesting vignette effects. Broadcast Safe ensures that all of your projects are color and luma safe for delivery to any broadcast market. Simply apply the filter at the top level of your sequence or comp, select the preset that corresponds to the broadcast standard that you require and render. The advantage of this filter over those that come standard within many NLEs or compositors is that it utilizes a soft knee approach to maintaining safe color and luma levels and by default does not hard clip the output. This allows you to avoid crushed highlights in the corrected output. The included Custom option opens up all of the controls for you to create your own customized presets. Motion Key allows you to isolate and remove a moving foreground object based on motion estimation. For example, you have a static shot of some buildings and a car passes by on the street in front of the buildings. You could use this filter to remove the car and replace it with the buildings. Akin to digital make-up, Beauty Studio was designed to automate the process of eliminating wrinkles, pores, and other undesirable blemishes from the skin-tones in a close up shot of a person's face. There are two stages to the filter: Building an isolation matte for the skin-tone, and smoothing the skin-tone. Additionally, you can use the integrated color correction tools to modify the hue, saturation, and brightness of the image. The color correction can be applied to the entire image or confined to the masked skin-tone. In this filter, the built-in PixelChooser by default has a color key enabled to begin isolating skin tones. It is critical for optimum results in Beauty Studio to review and if necessary fine-tune the skin isolation matte/mask generated by the PixelChooser. DV Fixer is designed to remove diagonal stair-casing (also known as aliasing or jaggies) that are apparent in images or clips that have been subject to DV compression, while maintaining the overall sharpness of the original image. Dust and Scratches removes unwanted dust and scratches from an image to help restore old and damaged footage. Lens Correction is designed to reduce or remove image distortion in source clips that were shot using a wide-angle or fish-eye lens. It can also be used to make simple perspective corrections. Lens Correction includes a number of presets specifically designed for GoPro action cameras. Magic Sharp uses algorithms to enhance image detail while minimizing artifacts associated with traditional sharpening tools. The core sharpening algorithm performs up to four passes labelled: Fine, Small, Medium, and Course. Each pass targets physical details that have wider and wider pixel dimensions, with each stage focusing on details of roughly twice the pixel dimensions as the previous stage. Additional controls allow fine tuning the amount of sharpening applied to individual color channels and to independent luma ranges along with the ability to suppress noise or grit introduced during the sharpening process. Flicker Fixer is designed to eliminate flicker from source footage. It provides three different methods for removing flicker: Frame Analysis and two Temporal Smoothing methods. Frame Analysis is for clips with flicker that is uniform throughout the frame -- e.g. flicker that is caused by unintended shutter speed or aperture variations from frame to frame. The Temporal Smoothing methods are for use with clips in which the flicker varies from pixel to pixel within the frame -- e.g. a scene that is lit partly by natural light and partly by a flickering artificial light. Noise Reduction smooths out noise by comparing each pixel with the pixels in its immediate temporal and spatial neighborhood. For each pixel, it blends in pixels that are close (in color) to the pixel, while ignoring pixels that are distant in color. This allows us to smooth out the noise without losing detail. This filter is designed to remove noise from camera images and will not work properly unless the input is fully opaque. Optical Stabilizer enables you to quickly and easily stabilize shaky video footage, such as clips that were shot with a hand-held camera. Optical Stabilizer uses optical flow technology to analyze every frame in the source clip to determine the movement of the camera and then adjusts the position, rotation, and scale of the clip to compensate for the unwanted camera movement. Depending upon filter parameter settings, the motion in the clip will either be smoothed or completely locked down. Unlike many image stabilization tools, Optical Stabilizer does not require you to set and keyframe user-defined tracking points, which is very useful for images where point tracking data is unreliable. Because the very nature of post camera image stabilization causes the image to be cropped, this filter includes post image stabilization options to fill the blank areas around the of the frame. The primary purpose of the Pixel Fixer is to fix bad pixels caused by bad pixels on the sensor in digital video and still cameras. The filter may also be used to fix bad spots on digital still images caused by dust on the sensor. Reframer was designed to ease the work of integrating video that was shot in portrait format into a landscape video frame. Typical application of this filter might be inserting footage that was sourced on a smartphone into an HD format sequence. Due to the special nature of this filter, the parameter list and suggested workflow can vary considerably from one host to another. Remover provides a semi-automatic way of removing small undesired elements from an image or video clip by cloning pixels from one user-defined section of the image to another section of the image. There are three stages involved in setting up this filter: Setting the destination (pixels to be removed / replaced), setting the source (pixels to fill the area to be removed), and selecting a method of removal. There are four distinct modes of object removal: Auto-Fill Sharp (fills the distinction shape with surrounding pixels), Auto-Fill Smooth (fills the distinction shape with surrounding pixels, then smooths the result), Clone Spot (clone stamp from source to destination, similar to paint cloning), and Clone Shape (fills the destination region with pixels from the source region). Each of these methods will yield a different result and, given the subjective nature of object removal from an image frame, a trial and error approach of going through the different modes is recommended. As you become more familiar with the filter and how it will operate on different types of images, the mode selection will become more predictable. Smooth Tone controls the smoothness of an input image or clip while retaining as much of the original image detail as possible. This process is achieved via the use of the image processing algorithms that are at the heart of the filter. The degree of smoothing is controlled by adjustments to the radius parameter, with higher values generating a smoother result, and the degree of image sharpness is controlled by making adjustments to the range parameter, with higher values preserving less image detail. Uprez is used to increase the resolution of source clips (for example SD to HD or SD/HD to 4K) while ensuring maximum possible image quality. Uprez uses advanced techniques to maintain and fine-tune image details, generating much higher-quality final images than can be obtained with standard host upscaling. Due to the special nature of this filter the parameter list and suggested workflow can vary considerably from one host to another. Wire Remover removes wires and unwanted objects from still or moving images by either cloning or blending pixels together from surrounding areas. This filter has several uses. When working with blue or green screen shots, use this filter to remove wires or eliminate unwanted rigs or objects prior to keying. You can also use it to blend replacement pixels over video dropouts or film scratches. Wire Remover also includes two motion tracker parameter groups. This allows you to track the ends of the wire if the ends move. Primatte Studio is a comprehensive blue/green screen toolset that allows you to easily chroma key and composite using the same Academy Award-nominated compositing technology as films such as the Lord of the Rings and Spider-Man. Exclusive features include automatic green/blue screen analysis, manual transparency tuning, adjust lighting to correct unevenly lit screens, foreground object detection to deliver a perfect key with a single color sample, and an integrated Mocha masking and planar tracking system. Light Matte uses applied light to create or modify an alpha channel. Rays of light spread from the light source point in all directions. As the rays expand, their intensities are affected by the luminosities of the pixels that they cross. The farther from the source the rays extend, the less they are affected by the intensities of new pixels that they cross. This process is referred to as attenuation, since the effect of the pixels on the intensity of the rays attenuates, or lessens, over time. The filter allows users to determine which source color channel is used to create the light and to calculate the intensities of the source pixels. Pixels with higher values in the selected channel are considered to have higher intensities. Alpha Process blurs the alpha channel of an image, performs levels and gamma correction on the output of the blur, and composites the output alpha with the initial alpha using the chosen apply mode. The filter also allows you to soften the matte by blurring the alpha channel after it is processed. Boost Blend is a compositing filter that blends two independent layers in a composition and adjusts contrast in the blended pixels. Unlike most transfer modes, Boost Blend adjusts the mix only where the source and blend layers are different. Boost Blend is especially useful when you composite an image over itself and do not want the transfer mode to affect areas where the blended pixels are identical to the source pixels. Chroma Key is used for compositing camera footage shot using a blue, green, or red screen as a backdrop over a new background video or a still image from a separate file. Chroma Key Studio is an all-in-one keying suite that combines screen enhancement, auto-garbage matte, and masking. Additionally, users are able to take advantage of the following advanced features: chroma key, matte cleanup, matte choker, foreground color correction, and light wrap. Composite offers a wide variety of options for compositing one layer over another. Composite Choker allows the user to contract or expand the edges of a matte to bring them closer to or farther from the foreground. Two Choke controls allow you to smoothly adjust the matte, while Region Parameter controls let you define a specific region of interest with which to apply the filter. Glow Matte outputs an alpha channel instead of colors. This filter is useful for making semi-abstract mattes based on a glow of any channel in the original image. It allows users to select the channel in the source image from which the glow is derived. Pixels with higher values in the selected channel are considered to have higher intensities. Two Way Key is useful for keying out a range of colors while retaining one color in the range. Two Way Key works by using a Key Color to determine which color is keyed out, then using a Keep Color to restore opacity to selected colors in the range. You can also adjust the range of colors to key out and key in using the Similarity controls. Light Wrap reflects a background image around the edges of a foreground image to form a border. This creates the illusion that light from the background image is reflected onto the foreground image. This creates a more convincing composite by making it appear as if the images were shot in the same environment. Linear Color Key creates a key based on the difference between the color of each pixel and the specified Key Color. The color comparison can be done in RGB or in HSL color space, and you can adjust the relative importance of each RGB channel with the RGB Weights parameters. Linear Color Key also allows you to remove unwanted foreground objects or restore opacity to a transparent region in the foreground using the region of interest controls. This feature is useful when the foreground has an isolated region that is similar in color to the background (for example, a person wearing a tie of the same color as the background). Linear Luma Key creates a key from a single channel in the source. This type of filter is called a luma key because the key is usually created from the image luminance, but you can also use any single RGB channel. You might want to examine the individual channels of the source and use a channel that provides more contrast between the foreground and background than the luma channel. Make Alpha Key creates a new alpha channel from one of the existing channels in the image and then applies levels and gamma correction to the new alpha channel. You can create many useful effects by making a Full On (completely opaque) alpha channel and using the built-in PixelChooser to control which parts of the image key out. Matte Choker is a tool for the often-frustrating task of adjusting mattes that are not quite right. A first-pass matte often has unwanted holes in areas that should be opaque, and/or unwanted spots in areas that should be transparent. These problems can usually be fixed with Matte Choker. BCC Matte Choker uses an iterative technique to process the source alpha channel. In other words, the filter applies one stage of the process to the source image, then applies a second stage to the output of the first stage, and repeats the process using the output of each iteration as the input of the next. Matte Cleanup is used to help correct imperfect mattes as well as generate interesting matte effects. Often a key can create an imperfect matte in which traces of the background color remain around the edge of the foreground subject. Matte Cleanup allows the user to fine-tune aspects of the composite blending, as well as choke the opaque regions to remove any unwanted fringes. PixelChooser, which features integrated Mocha planar tracking, provides numerous techniques for selecting which areas of an image will be affected by a filter. The PixelChooser has been incorporated into many of the filters in the Key and Blend Unit but is also available as a standalone filter. PixelChooser creates a matte/mask between filtered and unfiltered pixels, allowing far greater control over the design process. The matte/mask can be defined in numerous ways: Mocha planar spline tracking, host spline import (in AE), basic geometric shapes/gradients, luma/alpha/channel mattes with thresholding, and robust color keying. Because of the complexities of algorithms, some filters can mix in color channels from pixels that were originally transparent. This creates a premultiplied alpha channel which includes transparency information in the color channels as well as in the alpha channel. The Premult filter sets the color channels of all transparent pixels to the selected color, giving the user control of the color that is mixed in these cases. When you composite an image with a premultiplied alpha channel over a new background of a different color, the edges of the alpha channel show a "fringe" of the old background, because the edges of the alpha channel were blended with the original background color information. Premultiplied Alpha Key allows you to key out most of this unwanted color. RGB Blend provides independent compositing of the source image's RGB channels with the Mix Layer's RGB Channels. The brightness and contrast of the composite can also be adjusted independently for each channel. Rays Cartoon creates the light out of the Cartoon edges of the filter. Using it is the same as using one of the other Rays filters with the Light From channel set to one of the Cartoon Edges choices. Glare creates an effect producing a sharp refection. A luminance map creates the glare based on bright areas in the image. Glint creates a sparkle or ray burst effect. A luminance map creates the glints based on bright areas in the image. Edge Lighting finds edges based on pixel-to-pixel differences in any chosen channel in the source image or in the Edge Source Track and applies light to these edges. Highlights and Shadows are independently computed and can be blurred and applied separately to the source. Glitter creates a glittering or sparkling light effect. A luminance map creates the glitter based on bright areas in the image. Laser Beam adds multiple strobing lights to a scene with a built-in fog generator, which can be used to create light sword effects or to simulate an array of light beams. This filter is hardware-accelerated for enhanced performance. BCC Laser Beam can be driven by either the filter's own built-in 3D camera and lighting system or, when running in After Effects, by integration with the native host camera and lights. The built-in motion tracking allows you to track the motion of an object, then use the motion path to drive other geometric properties of the effect without the need for keyframing. Lens Flare 3D is a sophisticated lens flare visual effect generator that can produce many different styles and looks, from the traditional lens flare that occurs when a point light source is turned toward a camera lens to the more spectacular special effects that are often seen in science fiction movies. A base requirement for the generation of Lens Flares is a point light source, and Lens Flare 3D includes a built-in light source, with parameters to control the position of the light in 3D space. In addition to this, the filter is aware of any After Effects native lights that have been added to the scene and can be set to use any or all of these lights as source lights for the generation of single or multiple Lens Flares. As is the case with all filters in the Continuum filter set, the Lens Flare 3D includes a preset pop-up selector that can be used to load any of the factory-installed preset looks, which can be used as they are or can serve as a useful starting point in generating a customized look that can be saved and reused on future projects and comps. At the bottom of the Lens Flare filter control list you will find both a motion tracker control group and a beat reactor group. Both groups are used to control the movement of the Lens Flare in the image clip. The Motion Tracker can be used to automatically lock or track the Lens Flare to a specific scene element. The beat reactor can be used to lock the movement or the visibility of the Lens Flare in syncopation with the beat of an audio track. Light Sweep creates a linear beam of light that sweeps across your image. It is physically modeled after a light that is infinitely far away. The light is infinitely wide in one direction, and falls off in the other. Light Sweep also has some very useful edge detection and edge lighting features. Lightning is designed to generate photorealistic lightning bolts and plasma streams that will automatically flash or move over the image to which the filter was applied. This filter is based on OpenGL hardware-assisted rendering technology and will deliver a high level of performance when paired with a supported graphics card. The filter includes parameters to control and shape the overall appearance of the bolt as well as the bolt type and how it will flash or move on the viewer screen. The filter includes many presets that make fast work of setting up the filter; each of the factory-installed settings can be modified by the user and then saved as a custom preset, which can be used on any project and from within any supported host. Spotlight generates a realistic spotlight that can be placed and aimed at a target point on the image using on-screen position points. A range of parameters provide full control over the shape, width, color, and elevation of the light, offer edge lighting capabilities, and even allow you to place gels over the light source. The Rays Puffy filter light spreads from a source point, creating a soft, "puffy" appearance. The light is generated from a chosen channel in the source image. Rays Radiant Edges creates light from the edges of the image. This filter includes similar controls to the BCC Rays Cartoon filter. The BCC Rays Radiant Spotlight filter is a combination of a Light Ray Filter and a Spotlight. The spotlight can be used to matte either the light source or the rendered light. The Rays Ring filter masks the light source with a ring. The resulting light is generated from a selected channel in the source image and spreads from a source point in all directions. Rays Ripply combines a light rays effect with a rippled light effect. The resulting light is generated from a selected channel in the source image and spreads from a source point in all directions. Rays Streaky produces a light that contains streaks. The resulting light is generated from a chosen channel in the source image and spreads from a source point in all directions. Rays Textured filter creates a textured light using a noise map pattern. The resulting light is generated from a chosen channel in the source image and spreads from a source point in all directions. Rays Wedge is a light rays filter that mattes the light source with a wedge-shaped light. The resulting light is generated from a selected channel in the source image and spreads from a source point in all directions. Using the Spotlight filter to precisely light a specific area can sometimes be difficult. Reverse Spotlight allows you to define the lit region and computes the Light Source, Target, and Cone Width from this region. The Near Corner, Far Corner, and Light Squeeze controls in Reverse Spotlight replace the Light Source, Target, and Cone Width controls in the Spotlight filter. Stage Light was designed to augment the built-in lights in Adobe After Effects or to function as a 3D lighting system when used in supported non-Adobe After Effects hosts. Stage Light generates 3D volumetric lighting with control over the visible light levels as well as other real-world stage-light attributes, such as smoke particles. Stage Light creates this effect using either the host native After Effects lights or via the use of the filter's own built-in 3D lighting system. Corner Pin allows you to map media to a specific area on a moving object in a media file. For example, your media includes a moving bus with an advertisement on its side. You could use Corner Pin to track and replace the advertisement with a logo. Corner Pin offers a number of different ways to customize the filter: Pin Over Source displays the corner pin image composited over the filtered track, Corner Pin Only will display the corner pin image composited over the full-sized source image, Punch Hole displays the filtered track with an alpha channel where the corner pin image will appear, Show Corner Region displays the full-size corner pin track inside the corner pin region with the alpha channel outside the area of the corner pin. Match Move locks the movement of one image clip to another using the built-in motion tracking function. One of the great advantages of using this filter to composite within your host editing application is that it includes full DVE functions such as tumble, spin, and rotate, along with interesting lighting and light wrap compositing features that are normally found only in full compositing applications. Witness Protection allows you to track the motion of an object in a media file. You can then use the motion path data to control another aspect of the effect. For example, track a logo on a T-shirt and use a blur to obscure it. Users are able to apply various effects to a specific area, for example: Mosaic, Blur, Tint, Brightness/Contrast. Real-time GPU-based particles generation is a new interface that makes generating motion graphics like sparkles, smoke, fireworks, and explosions simple, and alpha blending options make compositing elements into live-action sequences a cinch. Particle Illusion can be run as a standalone application, but rendering is only available as a plug-in. Artists and Editors can use the standalone to create and save a preset effect outside a host application and then can render that saved effect from inside a host timeline. The Emitter library now includes a handy search function and has been rewritten, allowing users to access an unlimited number of emitters without needing to reload libraries. Particle Emitter 3D enables the generation of particle stream effects and can be used to create a large variety of naturally occurring effects, such as Smoke, Fog, Clouds, Dust, Fireworks, Swarming Bees. This filter includes built-in 3D camera and lighting options, and it also supports After Effects native camera and lighting systems to generate dramatic scene fly-throughs. This OpenGL based filter is hardware-assisted for enhanced render performance. Particle System is an auto-animated particle generator that provides in-depth control over individual particles as well as the overall shape and movement of the system. This filter offers extensive options for adjustment, enabling you to create a wide variety of useful effects. You can control the size, shape, color, velocity, and movement properties of the particles, adjust the size and shape of the particle production area, set points which attract or repulse the particles as they move, control the camera perspective, adjust how particles interact with the edges of the effect, and customize the animation. Organic Strands is a particle-based effect used to generate 3D strands with interesting looks and convenient animation options. Particle Array 3D generates a 3D array of particles and offers several interesting ways of manipulating the array based on graph controls, alternate After Effects layers, fractal noise patterns, and random dispersion. The filter supports AE lights and camera for simple integration into AE 3D compositions. It also includes an integrated Beat Reactor group for creating dynamic animations directly influenced by audio layers. 2D Particles breaks the source image into particles and disperses them in 2D space. It also provides a variety of explosion, velocity, and gravity controls to adjust the particles movement. You can also control the size, shape, density, and opacity of the particles, and create custom particle shapes and scatter wipes. Use the auto-animation feature to easily generate explosion effects or animate the filter manually for precise control. Rain is an auto-animated filter that generates realistic rain effects. You can composite the rain over any clip in your timeline. Rain allows you to control the apparent depth of the effect, as well as fine tune the density, speed, direction, and color of the drops. The built-in PixelChooser with integrated Mocha planar tracking allows for greater control over which areas of the image the filter should affect. Snow is an auto-animated snow generator which can composite snow over a sky color or an image layer. The filter offers extensive options for customizing the effect and allows you to create drifts or make flakes pile up along the edges of an alpha channel. The built in PixelChooser allows for greater control over which areas of the image the filter should affect. Sparks generates auto-animated sparks that shoot from a point and disperse. The sizes, shapes, and colors of the sparks can be adjusted to create unique effects. You can also adjust the speed of the sparks, apply a gravitational force, and add an interaction layer. Sparks can be added to transitions and other procedural effects, used to create atmosphere, or even to simulate space travel. Wild Cards is used to generate an array of 3D cards with interesting and convenient animation options. Images and video can be split across the card array to create a variety of effects such as video walls, logo assemblies, and animated banners. The 3D Image Shatter filter shatters the image in 3D space and disperses the image fragments. It provides a variety of explosion, velocity, and gravity parameters to control particle movement. In addition, 3D Image Shatter allows you to control particle size and shape, rotation, opacity, lighting, and explosion style. This filter is auto-animated by default, but you can manually animate it for more precise control over the movement and dispersion of the particles. The 3D Extruded Image Shatter filter shatters the image in 3D space and disperses the image fragments. Unlike the 3D Image Shatter filter, this filter allows you to create three-dimensional particles with adjustable extrusions. Additionally, it provides a variety of explosion, velocity, and gravity parameters to control particle movement and allows you to control particle size, rotation, opacity, lighting, and explosion style. The filter auto-animates by default, but you can manually animate it for more precise control over the movement of the particles. Cube models the source image onto one or more faces of a cube. You can use a separate media source for each of the six faces. Cylinder maps the source media onto a cylinder. You can fine-tune perspective, axial displacement, wrapping, opacity, and lighting. In addition, the integrated Beat Reactor control suite allows you to drive the effect properties based on the contents of an audio track. DVE models the source image on a two-dimensional plane which can then be rotated around the X, Y, and Z axes and positioned in 3D space. DVE also provides the following options to fine-tune your effect: motion blur, adjusting camera perspective, and adding up to three independent lights to the effect. In addition, the integrated Beat Reactor control suite allows the user to drive the effect properties based on the contents of an audio track. Fast Flipper flips or mirrors your image. You can flip your image vertically or horizontally, or define an invisible mirror line that mirrors your image in various directions. You can also blend the mirror line to produce a smoother transition between the original and mirrored images. Resampling is on a pixel-for-pixel basis, so the filter is fast and no quality is lost. Page Turn creates a 3D model of a page turning in a book or magazine, and allows you to place media on both sides of the page. Pan and Zoom automates the work of documentary-style pan and zoom effects, where a large still image file is moved along the x and y axis (pan) and is scaled up or down (zoom) in a composite, in effect, adding animation to a still image. This filter includes on-screen HUD widgets (heads-up display) to achieve this end-result with precision and ease, and also includes advanced algorithms that generate a razor-sharp image even when the image has been subject to a large transform scale. The filter can be run in full automatic, semi-automatic, or full manual animation modes, but any way you choose it's easy to use and generates smooth animation and a sharp image result. Sphere maps the source image onto a 3D modeled sphere. A number of controls allow you to adjust the position, scale, size, and pivot-point of the shape, crop and mask the sphere, adjust the camera perspective of the sphere, apply motion blur and lights, and control the compositing of the sphere with other objects. In addition, the integrated Beat Reactor control suite allows the user to drive the effect properties based on the contents of an audio track. Sphere Transition models the source image onto a sphere. Unlike the Sphere filter, the Sphere Transition filter allows you to animate perspective, which is useful in creating transitions. The LED filter lets you make an image, clip, or text element with alpha appear as though it was constructed out of an array of blinking or solid LED lights similar to the display boards that we see in sports stadiums. By default, the lights take their color from the clip to which it was applied and can be set to either square or round diodes or "bulbs". Alternately, the filter can apply a tint of color over the media element to which it was applied. Mosaic allows you to pixelate images to achieve a range of mosaic effects using a few simple parameters and a PixelChooser. Color Choker posterizes and blurs colors in an image clip for creative and artistic results. The media clip colors that the filter is applied to can be attenuated or remapped individually through the many filter parameters or together as an RGB group. Included in the filter is a checkbox control to convert images to monochrome before applying the built-in color blur or choke. Colorize Glow generates the glow from a single channel and then applies a gradient to the glow. It can be composited with the original image or viewed by itself. Damaged TV is designed to emulate the appearance of a CRT-style television set that is receiving a bad antenna signal or is in need of repair. The filter allows users to fine-tune a number of effects such as Gun Offset, Distorted Edges, Image Roll, Noise, Scan Lines, and Interference Lines. This filter features both fully-automatic and manual modes of operation. When using the filter in automatic mode, the filter will automatically animate image roll, scan lines, noise or any other visible parameter, and even though the filter is being used in automatic mode, you retain full control over every parameter. Drop Shadow allows you to apply an animatable drop shadow to titles or clips in the timeline. Edge Grunge can be used to create stylized titles that glow, burn, and disappear over time. At default settings, it is designed to be applied to titles or other moderately-sized alpha objects. When applied to large alpha objects or non-alpha video it can produce overly blown-out levels by default. This can be moderated by disabling the glow group to permit adding erosion to just the edges of these larger objects. The primary use of this filter is with text and other alpha objects. Grunge combines procedural algorithmic methods with real photographic image textures that can be used on titles to create unique grungy, degraded, torn-up, or melting looks. These same effects can be applied to background plates. Glow Alpha Edges applies a glow that adheres closely to the contours of the image clip's alpha channel or mask. This filter is designed for use with masks or images that have an alpha channel. Emboss simulates the appearance of an embossed or raised image by converting the source to a solid color and lighting the edges in the source's luma channel. Misalignment simulates the effect of misaligned RGB color channels by separating the RGB channels. In addition, the integrated Beat Reactor control suite allows the user to drive the effect properties based on the contents of an audio track. Multi Shadow allows you to composite three or more independent drop shadows over a source image. Prism can be used to simulate the photographic effect of chromatic aberration, where a bad lens can create prismatic color fringing along edges of contrast within the image. The filter can also be used to create wipe or blur effects and includes controls for image rotation along two points of one axis within the image, which with some settings lead to a pleasant twisting blurred effect. RGB Edges finds edges in each RGB channel independently, creates a new RGB image from these edges, and applies the new image to the source using the chosen Apply Mode and Apply Mix. The results obtained vary depending on the media and the exact settings used. Because the filter creates edge effects by emphasizing differences between adjacent pixels, edge filters are very sensitive to parameter adjustments. Often a small change in a parameter setting can dramatically affect the result. RGB Pixel Noise applies noise to each of the RGB color channels independently. Alternately, you can use this filter to apply noise to the source image's luminance channel without changing the pixels' colors. Scanline generates rolling RGB scanlines over the source image clip, emulating the effect of a computer monitor that was shot on video tape or film. The RGB bars' rolling scan lines that the filter generates can be offset from each other in yx space and time to generate photorealistic effects. The filter also includes a user-controlled noise generator function for added realism. Scatterize shuffles the pixels in the source image, creating a scattered effect. Video Glitch is an auto-animating filter effect for simulating some of the kinds of errors and artifacts that can be apparent during digital video playback. It's useful as a style element on video or titles to create a sense of energy and movement. It makes use of auto-animation so it requires little or no keyframing, and it also includes an integrated Beat Reactor for allowing its animation to be directly driven by audio. Video Glitch allows a single glitch to last for more than one frame with control over how that glitch grows and fades over its lifetime, thus allowing more dynamic and realistic glitch behavior that can be achieved with glitches that last only a single frame. A special Curves preview mode allows visualizing the relative locations of the glitches over time. Rays creates a ray burst effect. It is comprised of two discrete elements, the rays and the glow. The filter provides controls for adjusting each element individually. The rays can be composited over the source image, or you can generate a completely synthetic image. The Brick filter is a versatile generator of tiled surfaces with realistic texture and lighting controls. Cloth creates a texture resembling tightly-woven fabric. Clouds is a realistic clouds generator. Three different types of clouds automatically animate using the Direction, Angle, and Speed you set without using keyframes. Fractal Noise creates a simulated marble texture. The Mixed Colors filter produces a color noise map. Noise Map 2 uses a 3-dimensional Noise Map to generate auto-animating monochrome textures for use as backgrounds, mattes, or alternate sources to control other filters. The filter generates multiple layers of noise and superimposes them to produce the output texture. The biggest difference between Noise Map 2 and many other noise map filters on the market is Noise Map 2's ability to use an alternate layer or synthetic shape to modulate various aspects of the mapping. Pushing points around in the "Noise Space" based on modulation settings produces a lot of interesting textures. Caustics can be used to simulate the effect of light refracting through a surface of water and projected onto a surface (like moving water ripple reflections on a pool bottom). You can use this filter to create many types of effects where rays emanate from a point and are reflected or refracted by a curved surface. For example, you can use this filter to generate moving plasma fields, smoky particle effects, waves in a pool, and animating geometric patterns. The Reptilian filter produces a texture resembling a scaly or spotted animal skin. The Rock filter is a realistic rock generator. Stars is an auto-animated star generator which can composite stars over a sky color or an image layer. It provides control over the size, density, movement and color of the stars, and allows you to add galaxies. Stars can also use the alpha channel in any other layer as a map layer, allowing you to create skies in which stars fill a pre-composed image or logo. The Steel Plate filter creates a textured plate of steel generator. Veined Marble is similar to BCC Granite, but produces a texture with more pronounced "veins" and offers more controls for customizing the effect. Weave produces a texture resembling a very loosely-woven fabric, such as burlap or gauze. The Wood Grain filter creates the appearance of a solid piece of wood. The Wooden Planks filter simulates a surface covered in wooden boards, similar to a wood floor. Posterize Time can be used to create strobe effects by altering the frame rate of the source media and adjusting the length of time for which each frame is displayed. You can also mix the time-posterized output with the original in various ways. Beat Reactor can be used within Adobe After Effects to generate keyframes based on an audio track within the composition. These keyframes can then be used to affect other parameters within the composition by using very simple AE expressions to link the generated keyframes to other parameters, or by copying and pasting the generated keyframes to other parameters. Beat Reactor displays a spectrum graph including vertical bands representing the audio levels within various frequency ranges. This graph can be used to help target particular elements within the audio track for use in generating keyframes. The Time Unit includes a Jitter filter and Jitter Basic filter. The two are almost identical. Jitter provides more options for controlling the effect, while Jitter Basic does not offer all the parameters and is streamlined for creating a simple Jitter effect. Optical Flow estimates the motion between two frames of video and renders an intermediate frame that interpolates the motion. The synthesized frame contains a mixture of the previous and next frames, each distorted by an amount determined by the optical flow estimation. With this filter, you can smoothly slow down or speed footage. Optical Flow generally produces smoother animations than the Velocity Remap filter (below). Optical Flow synthesizes frames needed to complete the effect instead of blending adjacent frames as most retiming applications do. In essence, Optical Flow manufactures entire frames. Optical Flow analyzes the frames before and after the current frame to determine which pixels are moving. Then, only the moving pixels are synthesized, repositioned, and composited into the new frame. The intervening information is created by warping the two frames, estimating where each individual pixel should be at every new in-between point. The Temporal Blur filter blurs the image over time by averaging two or more source frames to produce each output frame. Time Displacement is a displacement map that operates in time instead of space. Pixels are displaced by mixing pixels from the source at the current frame with source pixels from previous or future frames. Basic frame blending is used to compute intermediate pixels and to produce anti-aliased results. Trails creates motion trails, video echoes, and video feedback effects which can be combined in a variety of ways. The Time Unit features both the Trails filter and Trails Basic filter. The two are almost identical. Trails provides more options for controlling the effect, while Trails Basic does not offer all the parameters and is streamlined for creating a simple Trails effect. The Velocity Remap filter allows you to adjust and animate the frame rate of a video image and to blend adjacent frames to create smoother motion effects. Light Leaks Dissolve creates a stylized pattern of bright lighting elements overlaid on the source footage, which automatically animates in intensity as your transition progresses to obscure the underlying dissolve between clips. The lighting elements simulate the look of light leaking through the gaps in a camera and partially exposing the film/sensor. Light Leaks Dissolve builds its pattern of leaks by layering up to four separate leak generators on top of each other with additional controls over the scaling, intensity, and apply mode of the combined leak elements. Burnt Film simulates the look of holes burning through a layer of film to reveal another image. This filter provides control over the appearance of the burned edges and the burn rate, and allows you to use a custom alpha matte to set the shape of the burn holes. Checker Wipe transitions between two layers by animating a checkerboard pattern of transparency which progressively reveals the underlying layer as the thickness of the transparent regions increases. The Composite Dissolve filter creates unique variations on standard dissolve transitions by using apply modes and levels/gamma controls to fine tune the look of the dissolve midpoint. Leveraging the range of looks offered by the apply modes, this transition can generate many new looks that still maintain the basic feel of a classic dissolve transition. It can be used in subtle ways such as employing the Hard Light, Soft Light, or Overlay modes to boost color intensity during the dissolve midpoint, which avoids the washed-out colors that can characterize a classic dissolve. Modes such as Multiply, Screen, and Add can generate interesting glow-like dissolves and hybrids between classic dissolves and dip to black/white transitions. Composite Dissolve offers the unique ability to select two different apply modes and control the blend amount between them for maximum control over the final look. Criss-Cross Wipe combines two independent Multi-Stripe filters to make wipes in a variety of patterns. At the default value, this wipe appears similar to a Grid wipe. Cross Glitch is an auto-animating transition effect for simulating some of the kinds of errors and artifacts that can be apparent during digital video playback. It is useful as a style element on video or titles to create a sense of energy and movement. It makes use of auto-animation so it requires little or no keyframing. Cross Glitch allows a single glitch to last for more than one frame with control over how that glitch grows and fades over its lifetime, thus allowing more dynamic and realistic glitch behavior that can be achieved with glitches that last only a single frame. A special Curves preview mode allows visualizing the relative locations of the glitches over time. Cross Melt uses a combination of auto-animating displacement, blur, and lighting effects that post-process an underlying dissolve to create a stylized melting or dream-like look as the transition progresses. Cross Zoom is an auto-animating transition which uses a zoom in / zoom out motion to create a dynamic look when moving from one image to another. Damaged TV Dissolve filter is an effect which simulates a weak or distorted video signal on a CRT television monitor for use as a transitional element between two images. Fast Film Glow Dissolve is a 100% GPU-accelerated filter that creates a glow animation that automatically animates as your transition progresses to obscure the underlying dissolve between clips. Flutter Cut produces a jumpy transition that cuts between the incoming and outgoing clips, with optional insertion of effects, colored frames, and alternate layers. The filter is always self-animating with no need to set keyframes. It renders a sequence of clips that by default alternates between the incoming and outgoing clips in a pattern determined by the Outgoing Clip Settings and Incoming Clip Settings groups. The controls in the Colors group allow you to add a pattern of colors or alternate layers to the output sequence. The effect controls at the bottom let you add a couple of simple effects to selected clips in the output sequence. The Flutter Cut effect produces (by design) a chaotic and rapidly changing output. Grid Wipe uses a cross-hatched pattern which expands from a center point to progressively wipe the image off the screen. Lens Blur Dissolve is a 100% GPU accelerated replacement to the original BCC Lens Transition filter. Lens Blur Dissolve uses OpenCL to deliver greatly increased render performance with a streamlined interface. It applies a lens blur defocus/rack focus-style effect to the specular highlights of the outgoing and incoming image clips causing the highlights to take on the shape of a simulated lens diaphragm. This filter includes a pop-up that can be used to match different looks that can be achieved in the physical world based on the lens aperture setting. Lens Distortion Wipe creates a transition between two layers where one layer is distorted as if viewed through a lens of changing size. Lens Flare Dissolve creates a flare animation that automatically animates as your transition progresses to obscure the dissolve between clips. It includes a full set of lens flare 3D parameter options to allow maximum customization for the look of the dissolve. Lens Flare Round is a dissolve-style transition which creates a flare animation that automatically animates as your transition progresses to obscure the dissolve between clips. It offers a simplified subset of the full lens flare parameter set, oriented towards making softer-looking elements. Lens Flare Spiked is a dissolve-style transition that creates a flare animation which automatically animates as your transition progresses to obscure the dissolve between clips. It offers a simplified subset of the full lens flare parameter set, oriented towards making a more star-shaped and spiked appearance. Lens Flash creates a flare animation that automatically animates as your transition progresses to obscure the dissolve between clips. It offers a simplified subset of the full lens flare parameter set, oriented towards making a large bright flash as the transition progresses. Blur Dissolve creates a blur animation that automatically animates as your transition progresses to obscure the dissolve between clips. Light Wipe uses a light source emanating from the edges of an expanding geometric shape to wipe away the layer. The generated light can be based on either a solid color or can be sampled from the source image to create more pronounced ray-like elements. Linear Wipe is similar to a standard horizontal wipe, however, it offers a variety of parameters for you to customize. Multi Stretch Wipe is a radial wipe with three additional stretch controls named Taffy Stretch. The Taffy Stretch parameters create interesting distortions without significantly impacting render times. Multi Stripe Wipe is a similar to a Horizontal or Vertical Blind wipe. It offers extensive controls to randomize the stripes parameters. Radial Wipe produces a radial wipe transition, and contains many controls for unlimited creativity, including Influence controls and preset edge patterns. At the default value, this wipe is similar to a Circle wipe. The Rays Dissolve filter creates a stylized volumetric lighting effect that automatically animates as your transition progresses to obscure the underlying dissolve between clips. Rectangular Wipe produces rectangular wipes. At the default value, this wipe is similar to a Box wipe. Ribbon Wipe transitions between two layers by animating parallel stripes or ribbons of transparency which progressively reveal the underlying layer as the thickness of the transparent stripes increases. Rings Wipe creates a radial wipe effect made up of individual ring bands that expand outward from the center or inward from the edges. Ripple Dissolve creates a rippling distortion similar to that generated by a raindrop or pebble falling onto a smooth pond. The distortion amount automatically animates as your transition progresses to obscure the underlying dissolve between clips. Swish Pan enables you to create fast camera pan style transitions between clips. It includes full manual override controls. Textured Wipe creates a non-geometric wipe using the Influence layer and the Texture settings. By default, the Influence is generated from the luminance of the outgoing clip when you apply the wipe as a transition and by the filtered clip when you apply the wipe as a filter. Tile Wipe creates a transition between two layers by dividing the footage into tiles and animating the scale and rotation of the individual tiles. Tritone Dissolve creates a tint/tritone effect with optional levels/gamma adjustments that automatically animates up and down in intensity while the underlying dissolve progresses to complete the transition. Twister transitions between images by simulating a tight twist in the image plane which animates along a chosen axis to progressively reveal the incoming layer on the newly exposed back side. Vector Blur Dissolve creates a stylized vector blur that automatically animates as your transition progresses to obscure the dissolve between clips. A wide variety of looks ranging from wispy blurs to stylized painterly or melted blends can be achieved by varying the blur controls or by browsing through presets. Water Waves Dissolve creates a rippling water-like distortion that automatically animates as your transition progresses to obscure the underlying dissolve between clips. VR Insert allows you to easily insert a secondary source clip, title, or logo into a 360/VR shot in true 360/VR space in either mono or stereo format. And this is in addition to providing a full array of controls to reorient the source in 360/VR space. VR Flicker Fixer reduces or eliminates flicker from live action 360/VR source footage, providing three different methods for removing flicker. Apply the Frame Analysis method on clips with uniform flickering throughout the frame, such as flicker caused by unintended shutter speed or aperture variations from frame to frame. Apply the two Temporal Smoothing methods on clips where flicker varies from pixel to pixel within the frame - for example, in a scene that is lit partly by natural light and partly by a flickering artificial light. Reorient a 360/VR shot in true 360/VR space in either mono or stereo format. The filter includes a set of intuitive overlay controls that map each section of the 360 source clip to its respective face in the 360 environment, emulating the view that a user would experience when consuming 360 media via a head-mounted display system like Oculus Rift. VR Blur generates out-of-focus effects by emulating the look of shooting with soft focus or a lens diffusion filter. It's designed to operate in 360/VR space with multiple edge wrap modes to process pixels that reside along the edge of the 360 seam. (Non-VR-aware filters will generate a hard line across the seam and prevent creating a convincing look.) VR Blur includes independent controls for the amount of blur along the horizontal and vertical axes, making it easy to emulate fast camera pans. VR Sharpen uses advanced image algorithms to enhance image detail while minimizing artifacts associated with traditional sharpening tools. The core sharpening algorithm performs up to four passes on Fine, Small, Medium, and Course pixel arrays, targeting physical details that have wider and wider pixel dimensions with each stage. Turbulence generates auto-animated gel-like distortion fields in an image clip based on input from the built-in noise map and turbulence controls. Morph performs a combined warp and cross-dissolve from one still image into another still image, resulting in the generation of an animated image morph image clip. The filter relies on the use of user-generated Adobe After Effects spline mask shapes to define edges on the source and on the corresponding destination images to create a realistic image morph. The Displacement Map filter uses the luminance or color information from an alternate video or still image track to displace the pixels in the source image horizontally and vertically. This filter creates a version of the source whose distorted regions correspond to the luma or color channel of the Map Layer's media. The Polar Displacement filter uses a Map Layer to displace pixels radially outward from the Center Point and angularly along an arc of a circle centered at the Center Point. The Ripple filter simulates ripples spreading out from a point of origin in a pool of water, similar to what you see after tossing a pebble into a pond. This filter automatically creates animated ripples and allows you to choose from a range of wave shapes. Twirl spins the image around a center point, creating a spiral of distortion. Vector Displacement uses the RGB channels in the Map Layer to displace the image in three different directions. Video Morph performs a combined warp and dissolve blend from one video clip into another clip, resulting in the generation of an animated image morph. The filter uses matched pairs of user-generated Adobe After Effects spline mask shapes to define edges on the source and the corresponding destination clips at key points along the timeline. For example, when morphing a face from one video clip into a different face in a second video clip, the user creates and animates matched pairs of open or closed spline shapes on the source image clip that follow the contour line of key elements in the source and destination images, such as the jaw line, eyes, ears, etc., and the filter uses these shapes to aid in generating a smooth morph transition between the two clips. While it is creating the image warp, the filter also generates a blend over time between the source and destination clips. In addition to the AE spline mask shapes, which the filter uses to define the warp, Video Morph also uses Key Markers, which serve as instruction points for the filter's software algorithms. The Key Markers' function is to instruct the filter on when to start and stop the image morph. Warp is used for the generation of static or animated image warps. The filter relies on the use of user generated pairs of Adobe After Effects spline mask shapes to define the start and stopping point for the image warp. You can use as many pairs of warp shapes as you like to warp the image. In addition, you can contain the warp to a specific region within the image via a single closed spline shape mask. Wave creates parallel waves instead of waves that radiate from a point.